iPatientCare EHR is a health records management solution which offers seamless integrations with third-party practice management, laboratory information,and revenue cycle management systems and with a certification for Meaningful Use Stage 2 Ambulatory and Inpatient, ONC and CCHIT; It is designed using Microsoft .net framework and has the capability to accommodate more than 200 physicians. 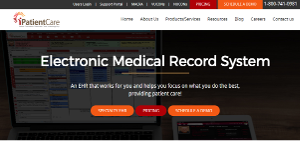 This electronic medical record solution which is accessible and can be deployed both in web-based and on-premise and described as a highly interoperable mobile healthcare software is composed of customizable features such as its charting module which captures data at the point-of-care, visual analog scales, speech recognition, pre-programmed buttons, patient chart tabs organizing, visit notes and templates restructuring, and E&M coding. It is an intuitive and specialty-focused EHR that has been serving the workflow of Ambulatory and Inpatient market segment. iPatientCare EHR has a charge capturing feature that optimizes the Evaluation and Management (E&M) aspect of practices. In this feature, new diagnoses as well as new CPT codes are easily added for assessments. ICD-10 and CPT codes can also be linked. In linking ICD-10 and CPT codes, users just need to select the preferred CPT code from a list and mark the appropriate ICD codes. E&M Advisor Tool is also provided wherein users can view E&M guidelines and checklists. This feature improves Meaningful Use performance and offers a real-time viewing and tracking of MU. iPatientCare also has a feature that allows a quick and hassle-free documentation of chief complaints, history of the present illness, review of systems; and past, family and social history. With the aid of panels that pop out to the right of the screen after a user made a selection, more details and information can be added in the documentation. The CC-HPI, ROS, and PFSH lists can also be customized or personalized so that users can add new content items and elements or search for a specific one. As a time-saving feature of iPatientCare, this manner of documentation enables physicians to spend more time with their patients and less with the charting. Moreover, the availability of flags in iPatientCare EHR improves coordination among doctors, healthcare staff, and other providers. Flags are used to prioritize tasks and follow-ups for patients. They can be set as reminders for physicians themselves or to their staff. Once the flags are set, they can be accessed through the dashboard and the physician would complete their corresponding tasks or send them to their staff for completion. If you are interested in iPatientCare EHR it could also be a good idea to investigate other subcategories of Best EHR Software gathered in our base of B2B software reviews. There are trendy and widely used systems in each software group. But are they necessarily the best fit for your enterprise’s special requirements? A market-leading software application may have thousands of users, but does it present what you need? For this reason, do not blindly invest in popular systems. Read at least a few iPatientCare EHR reviews and mull over the factors that you want in the software such as the price, main tools, available integrations etc. Then, choose a few apps that fit your needs. Check out the free trials of these platforms, read online opinions, get information from the vendor, and do your research thoroughly. This profound groundwork is certain to aid you choose the finest software application for your company’s special requirements. How Much Does iPatientCare EHR Cost? We realize that when you make a decision to buy EHR Software it’s important not only to see how experts evaluate it in their reviews, but also to find out if the real people and companies that buy it are actually satisfied with the product. That’s why we’ve created our behavior-based Customer Satisfaction Algorithm™ that gathers customer reviews, comments and iPatientCare EHR reviews across a wide range of social media sites. The data is then presented in an easy to digest form showing how many people had positive and negative experience with iPatientCare EHR. With that information at hand you should be equipped to make an informed buying decision that you won’t regret. What are iPatientCare EHR pricing details? What integrations are available for iPatientCare EHR? If you need more information about iPatientCare EHR or you simply have a question let us know what you need and we’ll forward your request directly to the vendor.